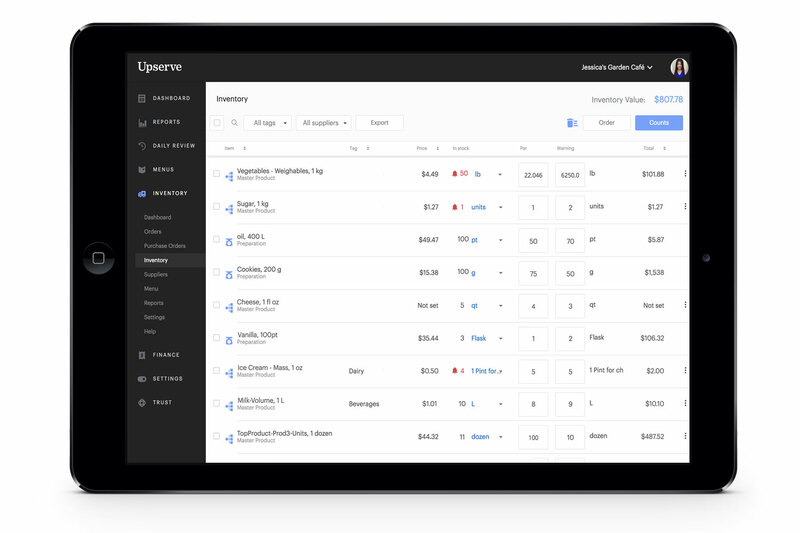 Upserve Inventory is an all-in-one Back of House purchasing and inventory solution designed to optimize restaurants and restaurant chain operations. Upserve Inventory is designed to work with your restaurant POS cut waste, reduce food costs and improve a restaurant’s bottom line. The cloud-based platform and apps feature sales-integrated automatic inventory replenishment, real-time food costing and online one-click purchasing from all your suppliers. Upserve Inventory provides inventory management for the Back of House. Designed by restaurant professionals, its easy-to-use tools reduce waste, cut food costs and make sure you keep more of your profits. Upserve Inventory is best suited for restaurants, coffee shops and bars that purchase from multiple suppliers. Upserve Inventory is also perfect for chains, groups, and restaurants that operate central kitchens. By integrating your Upserve POS with Upserve Inventory, you’ll be able to reduce inventory levels ounce by ounce for every dish you sell, creating real-time inventory levels and streamlining the stock replenishment process to just one click. This allows restaurants to accurately monitor their Actual vs Theoretical inventory, to alert for waste and theft, to reduce food costs and to improve their profit margins.